Killed March 17th, near Fayette, Missouri. Shields shot and killed a police constable who was attempting to place him under arrest. He was then arrested by another police officer. Later, he was taken from jail and lynched in the courthouse square nearby. Despite the very public location of the lynching, and the interaction between police, guards at the jail, the lynchers, no one was ever arrested or prosecuted for this crime. 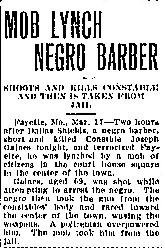 Nor is there any indication that guards at the jail attempted to interfere with the lynching of the prisoner.